Meet Emily E! 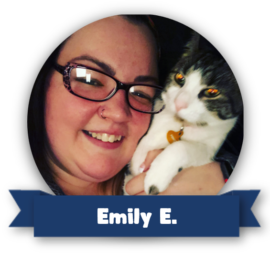 Originally from Rochester, Emily grew up spending lots of time on her Aunts farm and had lots of contact with many different animals with whom she fell in love with. She has grown up with cats in her home and currently has a kitten that keeps her busy when she’s not caring for our clients. Emily is also a licensed Esthetician and Nail technician and spends her free time exploring and practicing her craft.